If you need more than a dozen yoga mats, ordering a Yoga Mat Roll makes sense. 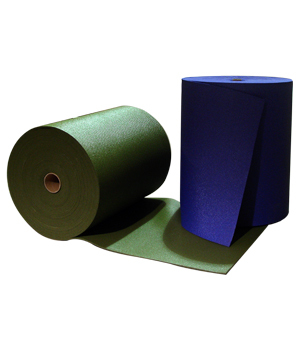 By ordering our 1/8” Yoga Mat Roll, and cutting the yoga mats yourself, you’ll save money. Each yoga mat roll is 103’ long, which can be cut into up to 18 mats. These comfortable mats can be used for yoga, core training or other exercise classes. You'll get value and durability while your students get comfort and slip-resistant traction. Choose from a palette of classic colors including black, purple, dark blue to hot contemporary colors like chocolate, olive green and sizzling red. When you’re looking for the most economical way to buy yoga mats in large quantity for your gym, fitness center or yoga studio, a Yoga Mat Roll is the perfect order! This great Yoga Mat Roll measures 103 feet long, and allows you to cut yoga mats of varying lengths specific to your student's needs. Our 1/8" thick mat provides traction, and at the same time allow for a firm surface for any yoga class. This classic sticky yoga mat is machine washable, and each roll is 103 feet long allowing you to cut 18 standard size mats easily with a sharp knife. I moved my holistic healing practice to a brick and mortar store front in October of 2018, and ordered all of my starter tools for the yoga studio from Yoga Direct. This was perfect to outfit our studio with mats, as we are in a town that has not had anything like this...ever. I love the purple that I ordered. They are thin. I'd go thicker the next time. Even my senior dog likes them. Great quality and affordable. As a rehab therapist for dogs, this is a great option for providing my families flooring options to reduce their dogs slipping and added injuries. I purchased the yoga mat roll to use in my elementary pe class. I couldn't be happier with the 1/8" mat. The roll was easy to cut into the length I needed. The color is brite and even throughout the roll. The mats are very comfortable! I am happy, the kids are happy! We bought these for our two elderly dogs who have a problem getting up on our hard wood floors. These are great! I love that we can cut them to size and there easy clean up. We had to pick rugs up and wash them before, nor sweep these or use a wet towel. Perfect for our house. It also helps muffle the noise for downstairs neighbors, we have two young kids that run through the house. Love these. After refinishing the studio floor, my equipment was slipping all over the place. I needed something to put underneath to stop this. Cutting size specific pieces of this yoga mat was the answer. All is well again. I actually used some of this roll of yoga mats to cover my wood floors for my elderly dog. It helps keep her from slipping and protects my floors. I will use the rest for Pilates when I see clients at home. I like the ease of being able to cut the length I want.